What Is the Oldest Religious Icon of Christ? There are many different types of Christian icons depicting Jesus Christ. Savior Made Without Hands, Christ Pantocrator, Man of Sorrows, and Christ in Majesty are just a few examples of religious icons of Christ, which can be found today. But have you ever wondered where these images came from? In fact, there is no clear description of the physical appearance of Christ in the Bible, and all those images are mainly based on His depiction in early Christian art, though it took several centuries to reach a more or less standardized form. Along with that, variants of Christ’s physical appearance do exist and can be found in both antique and modern icons. Anyway, whether it comes to Christian icons or classic art, the image of Jesus Christ still has certain traits that make Him instantly recognizable, and many of them came from the oldest religious icon of Christ Pantocrator. Dating from the 6th century AD, this important icon of Christ Pantocrator (see photo above) is considered the oldest surviving wood panel icon of Jesus and one of the oldest depictions of Christ on the whole. It is currently kept in St. Catherine’s Monastery on Mount Sinai, Egypt. The most interesting thing about this antique icon is that it is painted in a very unusual way. 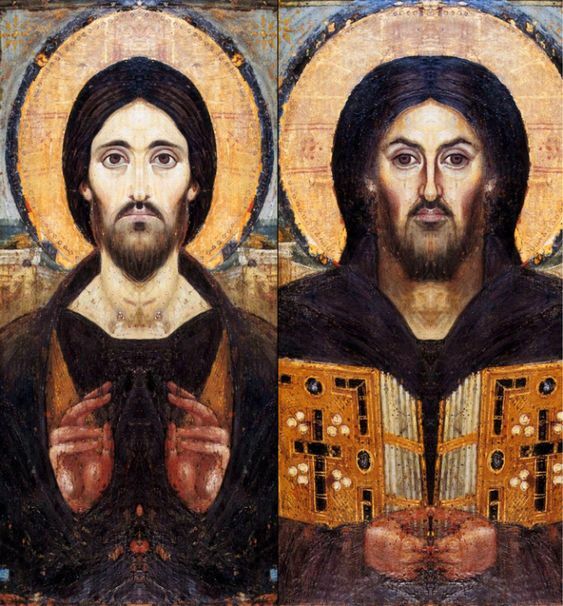 If you look closer to the depiction of Christ, you will notice that it is not symmetrical. It is believed that it was made deliberately in order to show the dual nature of Jesus, illustrating traits of both God and man. Thus, the right side of Christ, with His right hand raised in the gesture of blessing, represents the divine nature of Jesus, while His left side, with the left hand holding a Gospel book, represents His human nature. How did this unique icon of Christ survive? 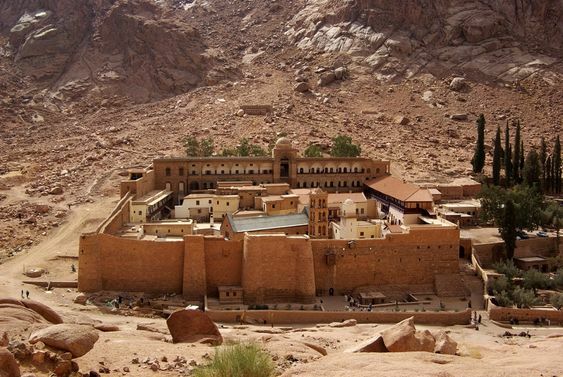 The fact is that St. Catherine’s Monastery, which was built by order of Emperor Justinian I between 548 and 565, is located far from any roads and routes, in the rocky desert of Sinai. Such a remote location allowed the monastery to keep its treasures safe from all the conquering armies and raiders. Even these days, to reach it is not that easy. However, it is definitely worth doing as St. Catherine’s Monastery houses not only the holy icon of Christ Pantocrator but more than 2,000 other antique icons and artifacts, dating from the 6th century to the modern times.